For the past couple of months, GT7 Motorsports pilot Anthony Gangi Jr. has been crisscrossing his way across the eastern half of the United States competing in multiple different series of competition. After a strong showing at the first round of the Great Lakes Sprint Series (GLSS) season opener back in April, Gangi Jr. returned to the same Pennsylvania circuit for the World Karting Association (WKA) Manufacturer's Cup event. 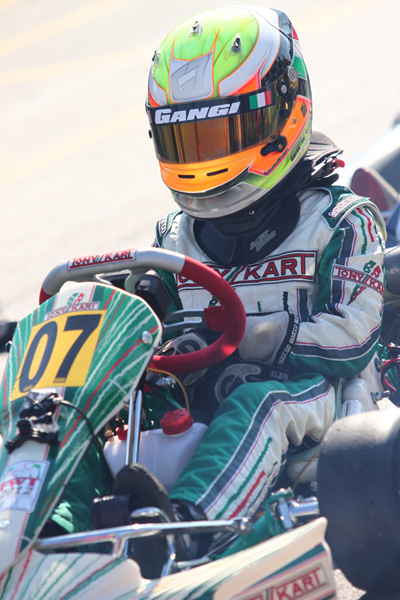 Then taking on more WKA and GLSS action in Illinois and Indiana in the recent months, Gangi Jr. is now set for two more weeks of intense racing action in the hopes of adding race wins and podiums results to his 2012 campaign. "The past two WKA Manufacturer's Cup event results have not shown our true speed," expressed Anthony Gangi Sr. "Pennsylvania was a rough event for us but in Indiana, two top eight qualifying efforts would result in bad racing luck. We are hoping to turn that around at our next national event." Early May would see the Brookville, New York resident do battle at the Pittsburgh Race Complex facility in Wampum, Pennsylvania for the third round of the WKA Manufacturer's Cup. With results not showing his true speed on the weekend, Gangi Jr. would score 11th and 15th place finishes in the Cadet Junior Sportsman divisions. At the fourth WKA round at the Jet Karting at Michiana Raceway Park facility in early July, the Tony Kart driver would qualify well, but run into some bad racing luck in the main events including being involved in a last lap incident while challenging for a podium position. When not seen on track at WKA events, Gangi Jr. would be taking part in the Great Lake Sprint Series as well as the Rotax Summer Shootout. June 15-17 would see the New Yorker at Jet Karting in South Bend, Indiana for regional level action. Scoring a pair of sixth place results there, Gangi Jr. improved his next GLSS event results at the Concept Haulers Motor Speedway in Norway, Illinois two weekends ago with second and third place podium efforts. Sandwiched between the two event weekends at Jet Karting, Gangi Jr. would also take part in the annual Rotax Summer Shootout. Taking place at the same facility as the United States Rotax Grand Nationals, the unofficial test weekend would see some of the country's best battle for the upper hand heading into the national championship event. Competing in the Rotax Mini Max class, the Tony Kart driver would have a steady day on Saturday after qualifying eighth. Claiming a fifth place result in the prefinal, Gangi Jr. would cross the line P8 in the main event. Looking for improvement on Sunday, Gangi Jr. turned his tenth place result in the heat race into a solid fifth place effort in the day's final. Gangi Sr. continued, "We have really been working hard on garnering good results. The next two weeks provide two big events for us and I am hopeful that Anthony can stand atop the podium." Traveling back to Illinois, Anthony Gangi Jr. and GT7 Motorsports will once again be on track at the Concept Haulers Motor Speedway for the penultimate round in the WKA Manufacturer's Cup. Competing in the Cadet Junior Sportsman categories, Gangi Jr. will make a quick turnaround at the event's conclusion and travel straight to Indiana. Competing for a national title in the Rotax Mini Max class, the GT7 Motorsports driver will look to use experience gained at the Rotax Summer Shootout to try and secure United States Grand National glory.